LOS ANGELES - Dec. 30, 2014 - PRLog -- iVlog (iVlog.com) will cover the cost of streaming, to bring the shelved film to all. 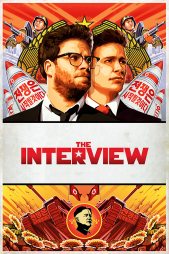 The Interview, starring Seth Rogen and James Franco, had a planned nationwide Christmas Day release. Sony Pictures withdrew the film after a major intrusion into it’s network, and threats against anyone who would show it, which prompted the nation's largest theater chains to say they wouldn't screen it. The entertainment giant then had a change of heart after President Barrack Obama, & Hollywood heavyweights such as George Clooney, voiced dismay at the decision to pull the film. The controversial movie has had a limited release in a handful of theatres in the United States. "Film is art, and artistic expression should be beyond the scope of outside interests. We'd like to work with Sony to make this film available to audiences at no cost”, said company founder, Alireza Mirmontazeri. iVlog's platform combines high quality streaming in a social environment. This unique structure allows it to distribute both user generated content & cinema quality movies to it’s audience, a demographic coveted by Hollywood.